PDF Studio 9 was released on March 21 2014. Customers who bought PDF Studio 8 after Dec 1 2013 get a free upgrade to version 9. Contact PDF Studio Support with any question. New Form Designer toolbar to create text fields, check boxes, radio buttons, lists, combo boxes, buttons and signatures fields. What’s new in PDF Studio 9? The new redaction feature makes it easier for users to permanently remove sensitive information from PDF documents. Apply the redaction annotations to remove the underlying content that intersects with the area redacted. Verify PDF/A compliance (for archiving) with document preflight. Apply Pro and verify digital signatures with a time-stamp authenticated by a trusted, independent authority. Many security standards now require this added level of security to encrypt administrative and legal documents. (Windows, Mac) Support for operating system root certificates when validating signatures. (Windows, Mac) Support for operating system digital IDs, including hardware keys, when applying signatures Pro. Apply Pro certifying signatures. This is the first signature on the document placed by the document creator and allows to define changes allowed to the certified document. Preserve on Save, enforce and clear document usage rights for Adobe Reader. Read more about PDF Document Permissions. Validation of multiple digital signatures. A new toolbar allows easy access to common annotations properties such as fill and border color, border width, and font size. The properties toolbar will show in the bottom right most section of your toolbar, but can also float anywhere on your screen. A new user-friendly color chooser shows a wider palette of standard colors and remembers the last sixteen custom colors across sessions. 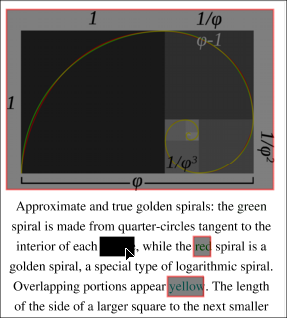 Markup text is automatically copied into the annotation’s note (see Edit-> Preferences -> Annotations). New Edit Interactive Objects Tool to select and work with annotations and form fields. Select individual or multiple annotations and form fields to move or edit their properties. Click on a single object, or drag to select multiple objects. This tool will make it easier to select and align multiple form fields or annotations, move links and signature fields, and make a quick edit on a form field’s properties without going into Form Editing mode. 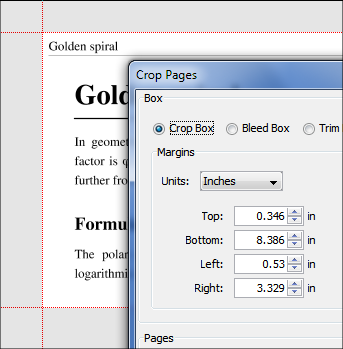 The redesigned crop feature now displays preview marks for the new margins on the page. Crop is also un-doable in this version. Allow to open password protected textbooks and e-books from online universities, such as the University of Phoenix, using a Vitrium DRM. Improvements in file chooser dialog: include files with upper-case extensions (Linux), attempt to open PDFs with no extension or an unknown extension.